The Sims is a video game series developed by Maxis and published by Electronic Arts. It is one of the most successful video games series of all time. As of April 16, 2008, the franchise has sold more than 100 million copies worldwide, and as of March 19, 2008, is the best-selling PC franchise in history. The games in The Sims series lack any defined goals. 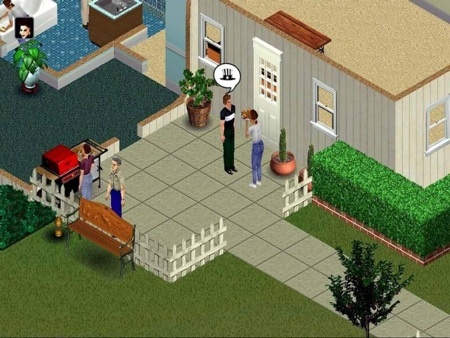 The player creates virtual people called "Sims" and places them in houses and helps direct their moods and satisfy their desires. Players can either place their Sims in pre-constructed homes or build them themselves. Each successive expansion pack and game in the series augmented what the player could do with their Sims. unsa ni about a game??? sa site lng ni? or kelangan idownload? Download. AWard winning ni xa. Naa gne ko cd ug dvd ani. ok try nako ngita ani n game. ehehh! s2rya nmn kag hubo2 dra..
HAHAHAHA.. jud, ang utok GREEN na. Gilumot na. Hay naku. gi lumot ndy ang utok ani..